Hello Sweet Pea Lovers. Today i like to Showcase one of Karen Middleton images "Rosana". She is kind a mystery Girl, when you can't see her Face, but you already know she is gorgeous. Don't you think? 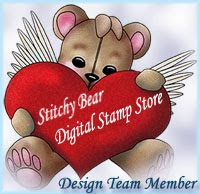 The good news is, you can have this image in Rubber Stamp or Digital image. Here is the link to the SHOP, if you like to check this out. So many choices in stamps or Artists. Here you can see better my embellishments. White background i embossed with the folder i got from Michaels Shop. Also i did stitching. This is it for today everyone, and i see you soon. Hey Nataliya, I love how you imagine the images, personality. The background paper is perfect, makes the image really stand out, beautiful frame, with all that bling,like all the hearts, 3 of them but all totally different, and those little curly ques. Looove her gray hair. Thanks for sharing and have a wonderful day..